I love sharing these “tried-and-true recipes” with you. We try a lot of recipes that we find on Pinterest — some work and some are complete failures — so it’s fun to be able to tell you what has worked for us! 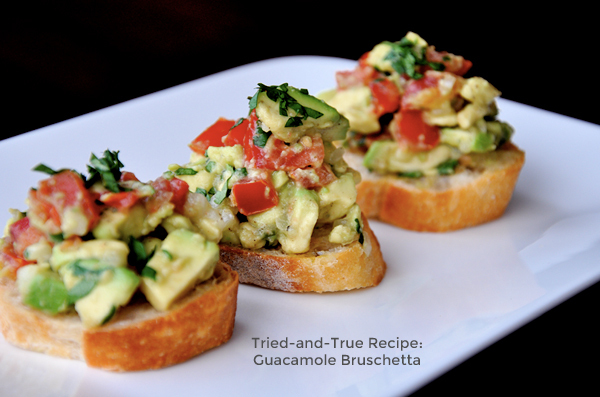 One of our all-time favorite recipes that we’ve been making for years is Just a Taste’s Guacamole Bruschetta. It’s basically a chunky guac on toasted garlic bread, which is simple and so so so yummy. I mean, you had me at avocado! This is the perfect thing to make during the summer when we want something quick and easy as a side or complete meal, and it’s also really great when we need to take something to a barbecue. When we’re lazy or it’s too hot to turn on the oven, we make only the guacamole part and eat it with tortilla chips. Mmm, I could really go for some right now! Check out the full recipe on Just a Taste! P.S. We’re in London, so follow along with us on Instagram @burritosbubbly! How Do You Define Your Decorating Style?